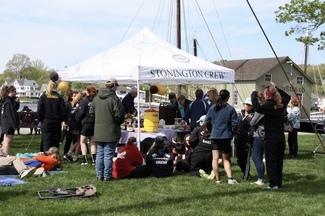 Friends of Stonington Crew purchases lunches for rowers during away-races in the spring. Latitude 41 Restaurant provides our food. Lunches include a salad or sandwich, cookie, chips, and fruit. Please note that due to the amount of food being prepared, the chuck wagon cannot be responsible for any issues regarding dietary allergies or restrictions. Lunch orders are due by 9 pm on the Sunday before each race. Use this form to place your order. Swing by the Chuck Wagon tent AFTER ALL BOATS ARE SECURED ON THE TRAILER to get your lunch! NEIRA: Race information is not yet available. Check back later for signup information.